Holiday Inn Evansville Airport Hotel - Exceptional Service and Uncompromised Convenience The Holiday Inn renovation is complete and we are now offering our guests a complimentary hot breakfast buffet. Whether working or relaxing, the Holiday Inn Evansville Airport Hotel is the perfect place to revive. The Holiday Inn Evansville Airport Hotel is less than a mile from Evansville Regional Airport and offers complimentary airport shuttle service. We are located directly on Highway 41 and are only 8 miles south of Interstate 64. Evansville is the third largest city in Indiana. Evansville is located right on the Ohio River and offers an abundance of entertainment options that tailor to all the senses. The Holiday Inn Evansville Airport Hotel is located only minutes away from exciting attractions like Casino Aztar, Mesker Park Zoo and Botanic Gardens, LST 325 Warship, Historic New Harmony and the Children's Museum of Evansville. You can also indulge yourself with dinner or room service and specialty drinks from Allegra Lounge. 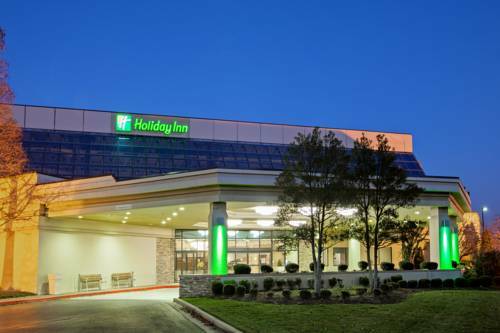 The Holiday Inn Evansville Airport Hotel is located minutes from Toyota, Berry Plastics, Mead Johnson Nutritionals, Atlas Van Lines, TJ Maxx, IBM, St. Mary and Deaconess Hospitals, University of Evansville and the University of Southern Indiana. Savor the continental cuisine of Allegra offering casual elegance with daily chef specials. Daily drink specials and food service.